Very Belated Holiday Post - Cooking With C.C. Well – I’m way behind and just now getting to a post about my favorite Christmas cookies and the challenge with them this year…..
I’m not sure of the history of these cookies – we just call them “Greek Christmas Cookies.” We’ve had these every Christmas I can remember. 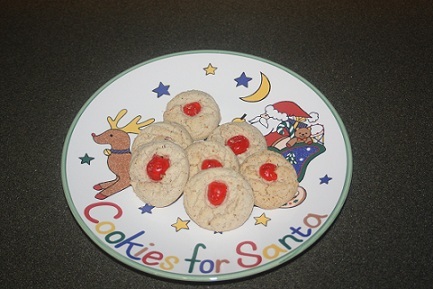 Christmas just wouldn’t be Christmas without these – spice cookies with a candied cherry on top. A while back I asked my Dad to give me the “old family recipes” and of course the Greek Christmas Cookies was one of the recipes he gave me. I, of course, had to make them for Christmas. My dad retyped the recipe and when I read the instructions, I thought it was strange, but it was an “old family recipe.” The recipe called for the sugar and FLOUR to be creamed with the butter. So, I figured the instructions, while strange must be right. I followed the instructions and it took forever for the flour, sugar and butter to become smooth and light. I can tell you if I didn’t have the beater blade for my mixer, I don’t think it would ever have come together. The dough ended up a bit drier but the cookies came out very good! About two weeks later, I got a call from Mom and Dad – seems that Dad made a mistake when he retyped the recipe. They tell me that the flour ISN’T supposed to go in with the butter and sugar. When Dad tried it, he couldn’t get the dough to come together – he had to keep scraping the mixing bowl and finally gave up. The moral of this story is to trust what you know – unfortunately, recipes do have mistakes…. 1. Grind Almonds until fine. 3. Add all the other ingredients to the creamed ingredients and knead well by hand. Shape into small balls (you can dust your hands with confectioners sugar to keep from sticking). I use about 1 tablespoon per cookie. Put 1/2 of a candied cherry in the middle of each ball and press the cherry into the dough. 4. Bake at 350 degrees about 15 minutes or until lightly browned on the bottom. Remove from oven and leave on cookie sheet until partially hardened. Remove to cooling rack until completely hardened. You can adjust the amount of the spices to get the flavor you like. I ground the spices fresh before putting in the dough. The recipe will make about 60 cookies. If you want to save some, freeze the cookie after adding the cherry. You can bake frozen later – just give them a few extra minutes. next post: Perfect Pies & Tarts – King Arthur Flour comes to town!